The 2 Lads winery itself is a destination in the countryside not too far from Traverse City, Michigan. It is built in a super modern style, sited on a bluff with a great view that includes sections of their 23 acres of vines. 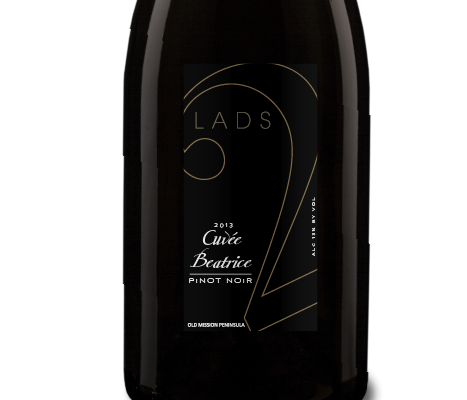 The 2 Lads Winery produces white, rosé and red wines. Given the northern location, it’s not surprising that two pinot noirs topped my list of best-crafted wines during an impromptu tasting here: the 2016 Pinot Noir and the “reserve category” 2016 Cuvée Beatrice. Both had light, bright fruit with a tinge of burnt sugar and earthiness. The Cuvée Beatrice also showed an exceptionally smooth mouthfeel, enriching the flavors and compensating for some shortness in the finish. Both wines erred slightly on the side of sweetness for me, but this seemed only to enhance their popularity with other tasting room customers.